The new book by Michael Kurtz, Mentoring Pew Sitters into Servant Leaders, was highlighted by the Lewis Center for Church Leadership in a recent website post. Michael Kurtz describes a simple but profound leadership development formula in which each leader is responsible for mentoring new leaders and creating the expectation that those new leaders will also mentor others. It is a leadership succession plan begun by Jesus himself. Thank you for your continued support of the Ministry of Plowpoint. 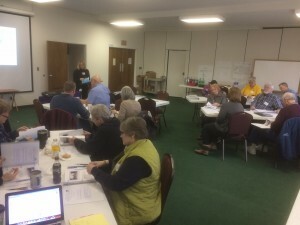 Thanks to these faithful disciples who gathered on a rainy/sunny Saturday in Charleston, West Virginia for Plowpoint Choosing the Faithful Path Training. This group will be working throughout the West Virginia Conference to strengthen the ministries of the local church seeking to fulfill our call to make disciples of Jesus Christ for the transformation of the world. Group gathered at St. Mark’s UMC in Charleston, West Virginia for training. 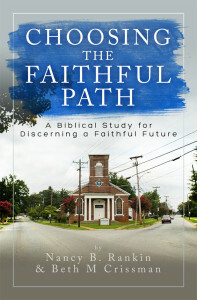 Choosing the Faithful Path is back in stock. We were short on stock of the book for a few weeks and have now received delivery of the third printing. Shipments are underway to catch up on your orders. A new Plowpoint resource has been published, The Shepherd’s Staff, a resource guide for praying for your pastor. This prayer guide, written by Revs. John Franklin and Kari Howard, contains prayers for a congregation to pray for their pastor through the week. A prayer focus for each day leads the congregation to pray for their pastor’s ministry on Sunday, their relationship with God, their relationships with others, their families, their leadership and other topics. Already groups in several churches are buying copies and are praying for their pastor. Some pastors have purchased copies to give to other pastors in their missional networks, small groups and clergy gatherings. This prayer guide is a resource for the entire church and will strengthen the ministry of your pastor and thus strengthen the ministry of your church.